Photo courtesy of SeaWorld. All rights reserved. Sea World is one of my family’s favorite places. We love visiting the park because of the fun rides and the incomparable opportunity to get close and personal to so many amazing sea creatures. That is why I was so excited to hear about the new “Just for Kids” Festival. This kid-centric festival brings families together to enjoy fun rides, adorable animals and an all-new party zone and lets families experience SeaWorld’s 50th Celebration through the eyes of a child. 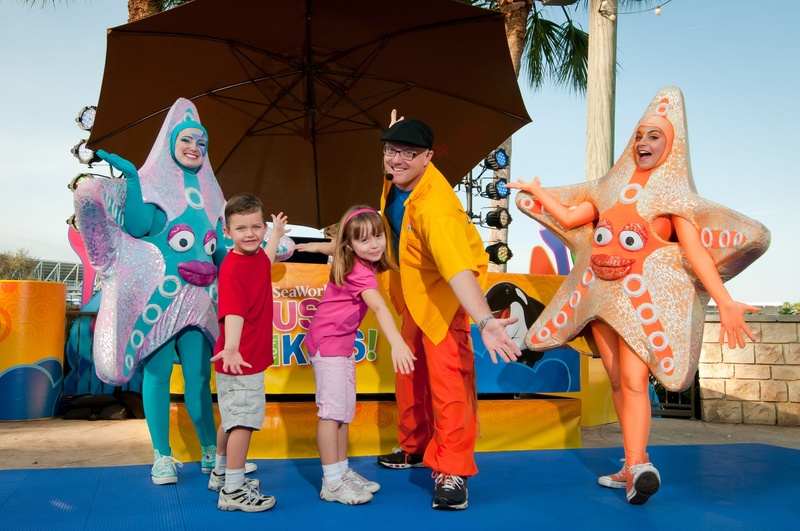 Sing, dance and play the day away Saturdays at SeaWorld Orlando’s “Just for Kids” Festival. This family celebration is included with park admission and takes place Saturdays fromMarch 22 – April 12. Then end the night with Shamu & Crew at the Shamu Dance Party at the Village Square located at the front of the park. The party begins one hour prior to park closing with a stilt walker emcee who fills the square with music that the whole family can dance to, including popular line dancing songs and party favorites. The Shamu Dance Party continues until 30 minutes after park closing.Visit SeaWorldOrlando.com for complete details. The best way to experience all of the fun, music and treats at “Just for Kids” and SeaWorld’s 50thCelebration is with an Annual Pass, starting at just $13 per month for Florida Residents. Pass Members can enjoy all four Saturdays of “Just for Kids” fun and all of the amazing special events throughout the year, plus the unforgettable animal encounters, world-class thrill rides and family fun found only at SeaWorld. 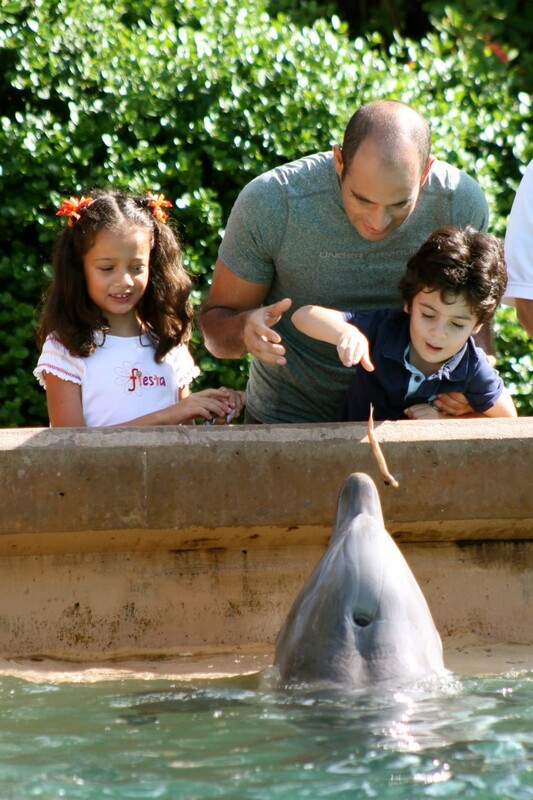 My family feeding the dolphins at Sea World Orlando. ALL-NEW! Rockin’ Rockhopper Party : Starting at 11 a.m., families can experience warm-hearted whimsical fun and make lasting memories as they dance along to family-friendly DJ’s at the Rockin’ Rock Hopper Party in Antarctica – Empire of The Penguin®, play games, such as Rock Hopper Ring Toss and Penguin Plunge, enjoy live penguin appearances, snow moments, snacks, face painting, caricatures and meet the one and only Puck, star of Antarctica: Empire of the Penguin. ALL-NEW! SEA Garden: Share the wonder of close-up encounters with amazing animal friends and learn how we care for our natural world at our all-new SEA Garden. Shamu Dance Party: Dance the night away with Shamu & crew at the Shamu Dance Party at the Village Square located at the front of the park. The party begins one hour prior to park closing with a stilt walker emcee who fills the square with music that the whole family can dance to, including popular line dancing songs and party favorites. The Shamu Dance Party continues until 30 minutes after park closing. Ocean Adventures Kids Program: Kids can go on an educational, card collecting program, also included with admission, starting at11 a.m. Children will look for the Sea Star icons inside the park, where they’ll discover fun, educational activities. At each location they will collect a stamp and a limited edition Explorer’s card. 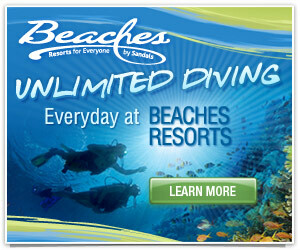 Once they visit all four locations, they’ll receive a coupon to redeem at select gift shops for a special SeaWorld prize. Limit one prize per participating child. 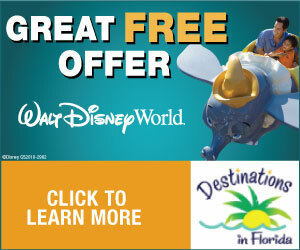 Enter the SeaWorld 50th Celebration Sweepstakes! Follow Sea World Orlando on Facebook, Twitter and Instagram for the latest details about SeaWorld Orlando’s “Just for Kids” Festival. Join the conversation by using the hashtag #JustForKids.